50 Marlborough Street was the home of the Boundy Family from the mid 1930’s until 1958. 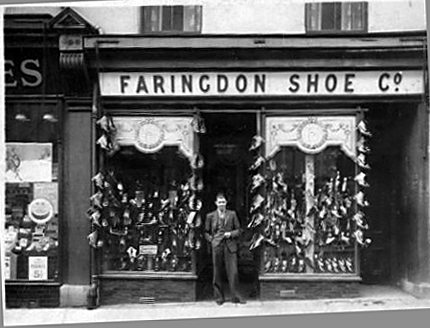 The shop during that time was Faringdon Shoe Company and was managed by my father Ernest Boundy together with my mother Violet. Before the 2nd World War my grandparents, William and Ellen Meyrick, ran the pub at Mutton Cove and it was there that my brother Peter was born in 1937. The Family lived above the shop throughout that time never even leaving it during the bombing raids of the war. On the ground floor they made the coal ‘hole’ under the stairs into a small living area and during the raids would hide there until the all clear. My brother spent many happy times after raids running around the bombed sites collecting shrapnel from the latest raid. Ernest Boundy c1950, outside of the shop he operated at 50 Marlborough Street. Before the war Marlborough Street and Fore Street were a hive of activity with many shops and businesses operating throughout. All that was left in 1945 was that part of Marlborough Street still in being and a few premises in Fore Street, the Midland Bank and Marks and Spencer’s coming to mind. All of Marlborough Street south of Granby Street was gone. Princes Street just disappeared. About 75 yards east of the bottom of Marlborough Street on the south side of Granby Street stood the Salvation Army Hall where many young souls would spend an evening of entertainment of games etc several times a week. Other than that the entire area was a bomb site. My Father was a War Reserve Police Officer and I can remember him telling me how, during air raids two police officers had to go to the top of the Column in Monument Street and spot for fires. One officer would be outside and the other inside phoning through the information. He also told me of the many sad times digging out bodies from the destroyed buildings in and around Marlborough Street. I was born at the Alexandra Nursing Home in 1946 and eventually followed my brother in attending York Street Primary School. He passed the exam which allowed him, in 1948, to go to Sutton High School. I remained at York Street until its closure in 1956 when we all moved to Mount Wise Primary school under the leadership of the Headmaster Mr Cutler. I was there for only one year as I became one of the first two boys to pass the eleven plus and went on to school at Devonport High. I do recall my Form Master as a Mr Grant and one of my earlier teachers at York Street as a Mrs Farron. Marlborough Street as I recall was full of ordinary everyday shops. Next to us at No. 52 was Pearkes the grocers shop and at 48 was Halfords. 44 was a clock and watch shop and opposite on the corner of Granby Way was Vospers Florist. At the north end of the street on the east side was a Chinese laundry run by the Wing family. Jimmy, a mad Liverpool FC supporter was unable to read or write English so all his correspondence was brought to my father for him to deal. We were very close friends of the Wing’s and on one occasion my parents acted as stand-ins as Godparents for Jimmy’s first born as those previously selected were unable to get out of China at that time. I do know that Jimmy’s brother went on to have a very successful Fish and Chip shop in one of the roads leading off Albert Road. In fact I believe he was one of the first to serve curried chicken as an alternative in Plymouth, and very good it was too! Pearkes the grocers also ran a mobile shop serving mainly the villages in East Cornwall and this was run by Jack Glanville who eventually came to live above the shop at No 52 with his wife Eileen and their children, Barry, Adrian and Linda. Barry in fact was my closest friend during my time living in Marlborough Street and we spent many an hour playing in the old Devonport Park. Of course this was before the road was put through the middle of the park itself. Marlborough Street of course was on the main route from the Torpoint Ferry into Plymouth and was quite a busy thoroughfare. Summertime was spent mainly in and around Mount Wise swimming baths which in those days consisted of two 50 yard long pools and a shallow children’s pool where the play area is now situated. I can recall my parents buying me a season ticket for the entire summer for five shillings (25 pence now). This was the home of Devonport Royal Swimming Club which at that time was one of the best in the west. It had a very good water polo team and would attract many a crowd when they were playing competitive games. The club were also responsible for organising the annual Cremyll swim, when members were taken by boat to Cremyll and then swam back to the pool area. When the dockyard extended and took most of the area to the south of Granby street not only was York Street school lost but also one of the most beautiful churches in Plymouth, St Mary’s. My brother was a leading choirboy during the late 40’s and early 50’s and I spent a short period in the choir as a boy soprano. Rev “Nacker” Bennett was in charge during this period and he was a real character of the area. I seem to recall that all of the pews were transferred to St Aubyn’s when it took over as the main church in the area. The Dockyard extension knocked the stuffing out of old Devonport - splitting the area in half and taking a lot of the historic buildings away. The family moved away in 1958 and did not return to Devonport to live but did spend most of their lives in the Plymouth area. I left Devonport High in 1962 and joined the Army until 1973. In 1973 I became a Police Officer in the Dorset Police from where I retired in 2003 as a Police Inspector. I now live with my wife in Dorchester close to my daughters and grand-daughter.